I just watched this incredible film the other night with my niece Anna. 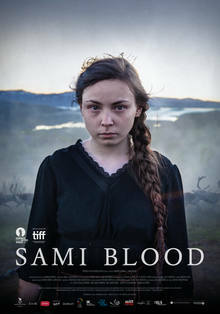 Achingly beautiful and profoundly sad at the same time, the most potent scenes of Sami Blood are like a haunting piece of music, with little or no dialogue. Yet they stick with me like a powerful dream. I've rarely experienced a movie that depicts the overt and subtle effects of racism, colonialism and internalized oppression in such a visceral manner. What can you say about a system that compels one to reject their own heritage, their own language, their own family, their own identity? And yet the land itself seems to call her back. My father, like the Sami girl in the film, was ripped from his idyllic childhood by unfortunate circumstances, a childhood where he spent his summers living in a tent. After his parents died he went to live with Swedish immigrants who "civilized" him, taught him to play the piano, enrolled him in art school. It wasn’t a boarding school but it had a similar mission. He recalled that as a child he was “measured by doctors" who told him the shape of his head was "Lappish." I don’t believe he felt shame. If anything it made him curious, fascinated by a unique culture he felt a personal link to. But like so many children of immigrants from Europe he was thrown into the great melting pot where the lucky ones become “white."